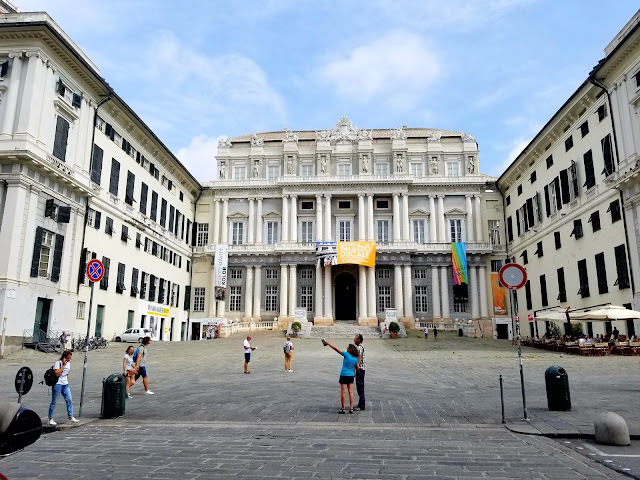 One place that is a must see when visiting Genoa, Italy, is the Historic Center that lies behind the walls of the city. 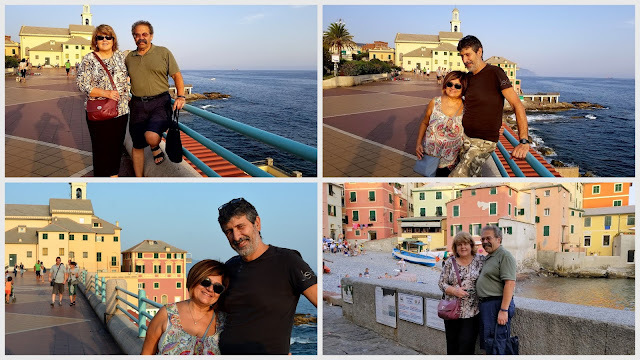 My husband's cousins took us here one day to enjoy a stroll together, see the sights and have dinner. We took the excellent Genoa Metro towards the eastern gates of the old city. Seeing the juxtaposition of the modern motorcycle means of transportation in Genoa, with the ancient towers, made me smile. Genoa is noted for its many examples of medieval, Renaissance, Baroque, and Gothic architecture. 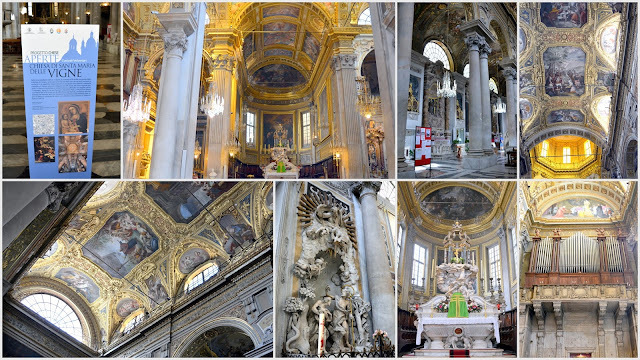 The Ducal Palace, San Lorenzo Cathedral. 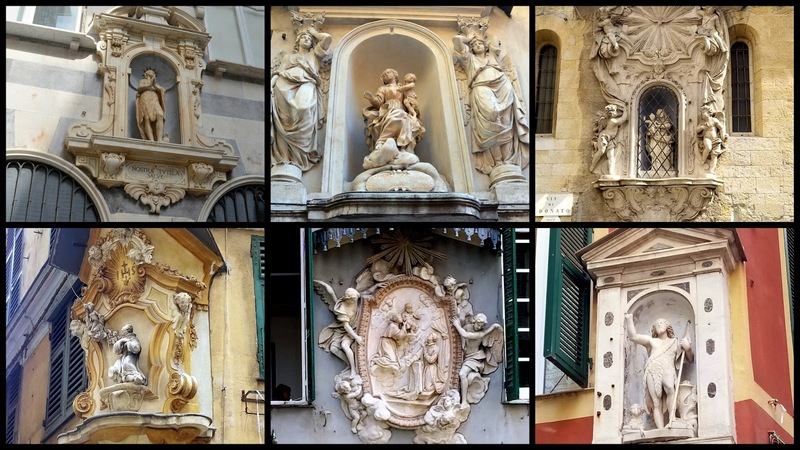 Church of San Matteo, and Palazzo San Giogio are some of the most important historical monuments. 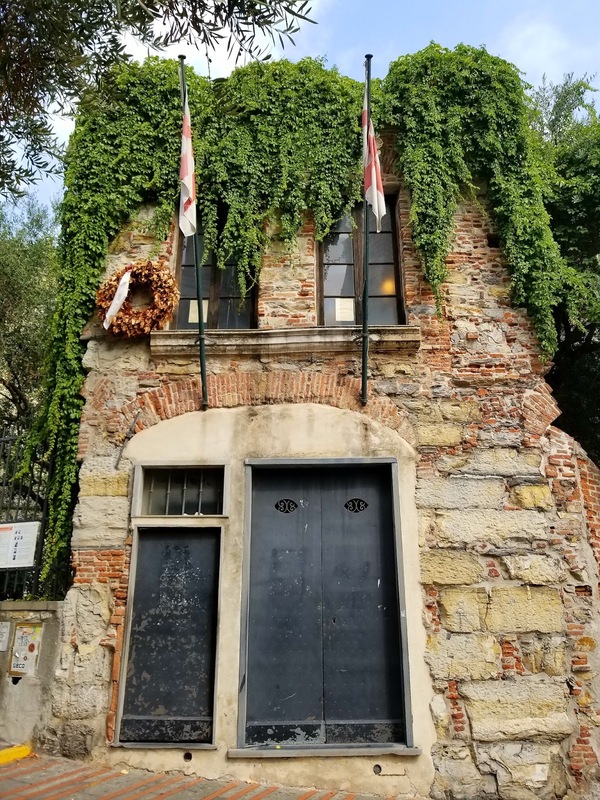 Right outside the city walls is the House-Museum of Christopher Columbus, who was born in 1451, and was the explorer who was credited with discovering the Americas in 1492, is an 18th-century reconstruction of the original building where he lived in his youth. It was destroyed during the French bombings of 1684. The magnificent Porta Soprana (also known as Porta Sant'Andrea) is one of the many openings in the ancient Walls of Genoa. 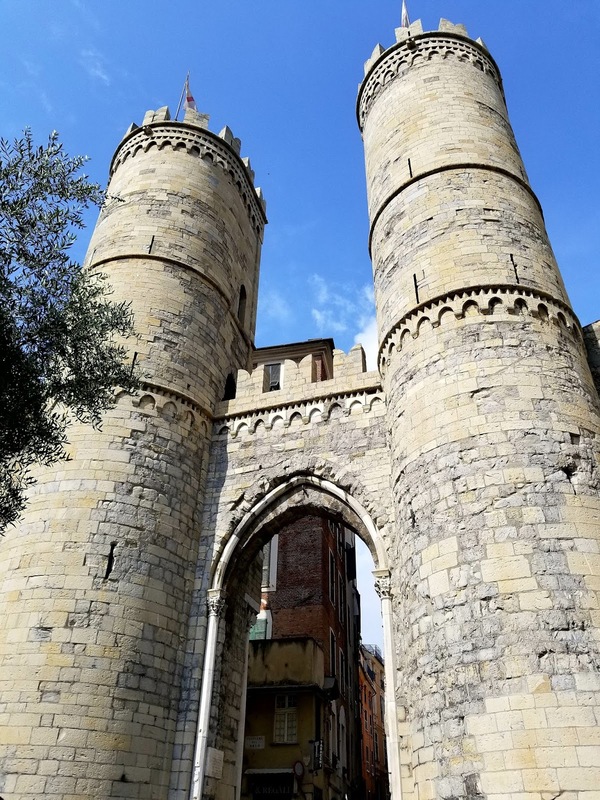 In 1155, the Genoese feared an attack by Frederick Barbarossa and created a circuit of walls enclosing the majority of the city. A plaque inside the Porta Soprana entrance translates roughly as "I am defended by soldiers and surrounded by amazing walls.....If you come in peace, you may touch these doors. 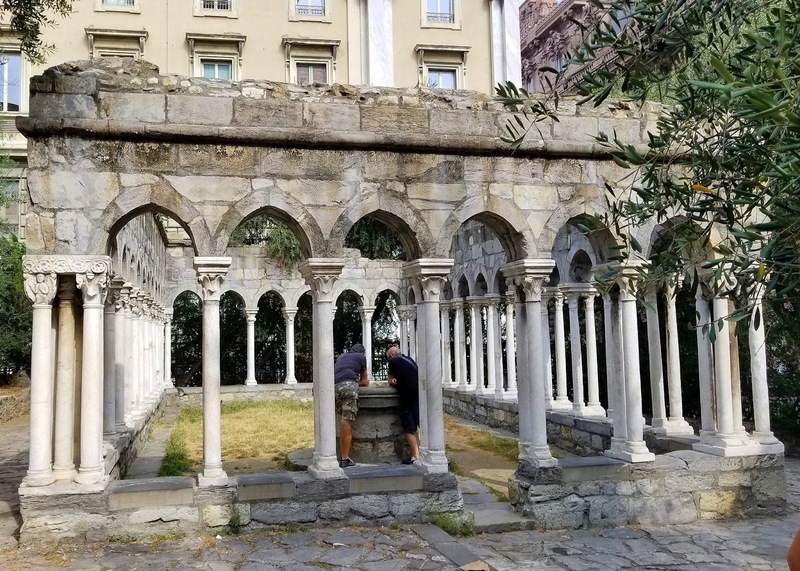 If you come looking for war, you will retreat sad and defeated..."
Right inside the gate were the ruins of an ancient Cloister of Sant'Andrea, once part of a monastery in the 11th century. 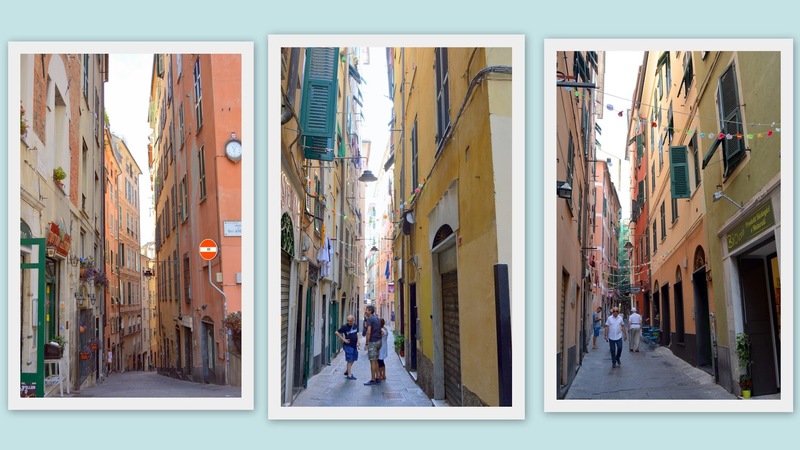 The Historic Center of Genoa is made up of many buildings with narrow alleys called "caruggi." We walked along admiring the many shops, restaurants and personal residences located there. 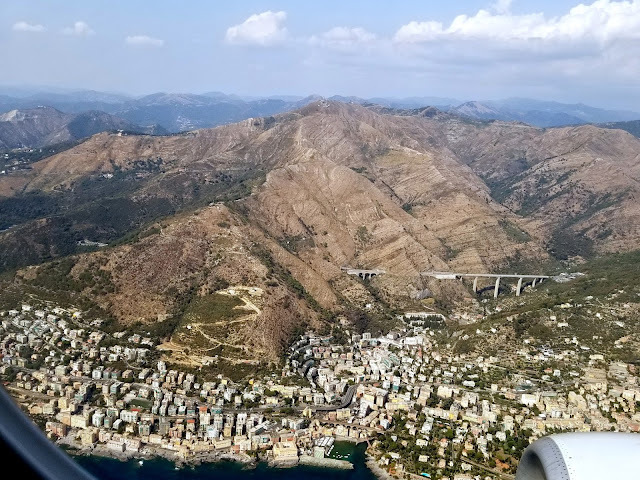 High above were many different towers that caught my eye. 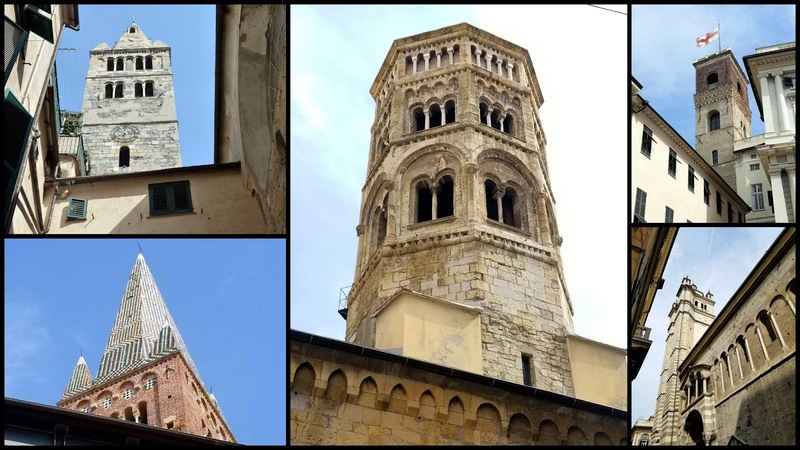 While we walked around we could hear many different church bells ringing at noon. Click on the video above to hear them. Duomo di Genova or Cattedrale San Lorenzo * Church of Genoa or Cathedral of Saint Lawrence) was built between the 12th and 14th century. 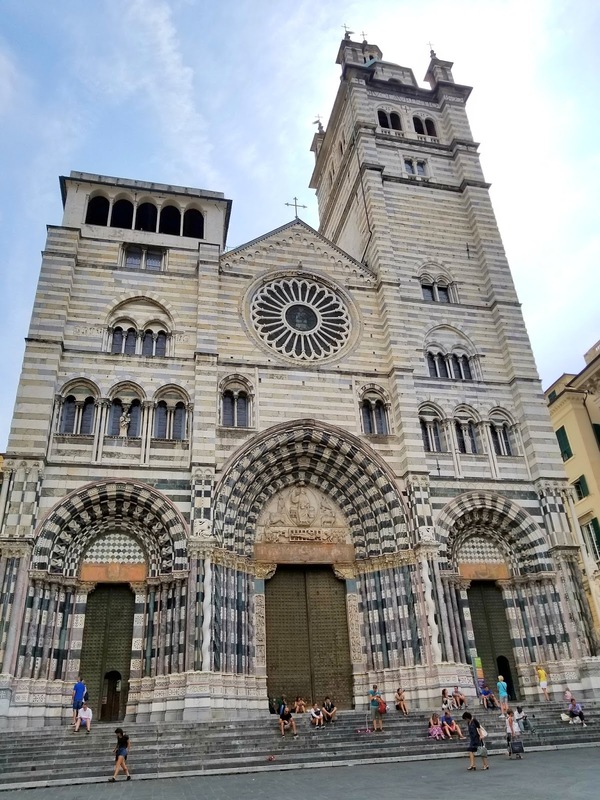 It is one of the most important churches in Genoa and the symbol of the city. 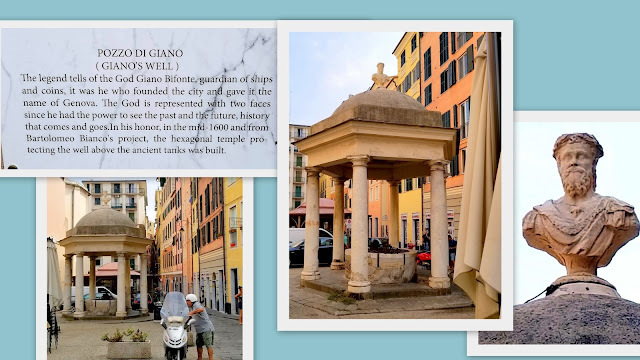 A church has been located here since Roman times. During World War II on the 9th of February 1941, the British battleship fired a bomb into the Genoa's cathedral. The bomb reached the church, punched the cathedral roof and did not explode! 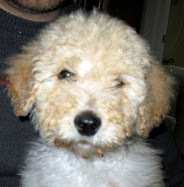 That event was called the Saint Lawrence miracle. 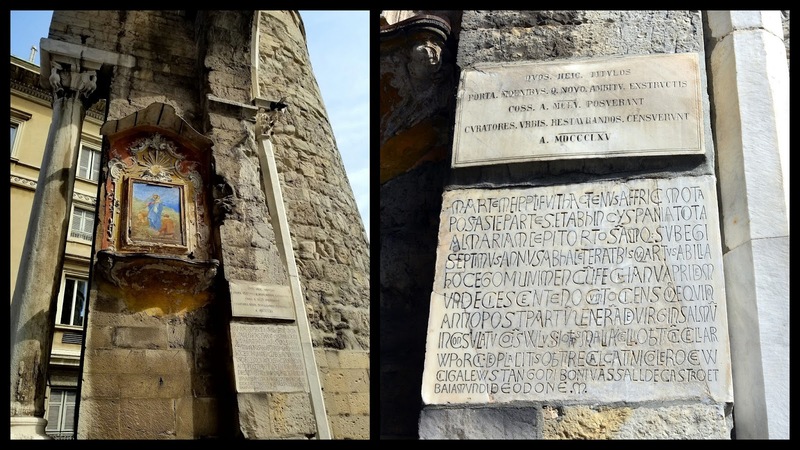 It is still possible to see the bomb that was left in the church. The facade of the cathedral is very ornate! 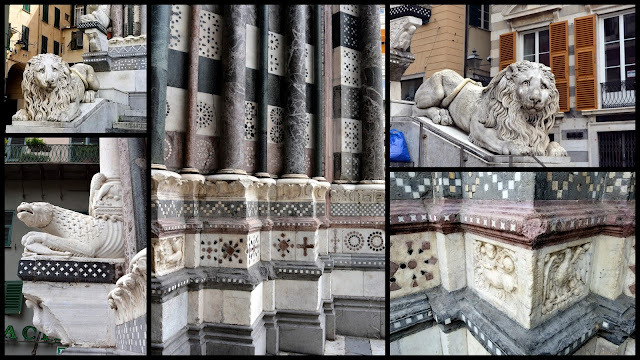 Lions flank both sides of the stairs, with gargoyles above them. We were able to go up these steps towards the second level of the church and then all the way to the top of the bell tower. 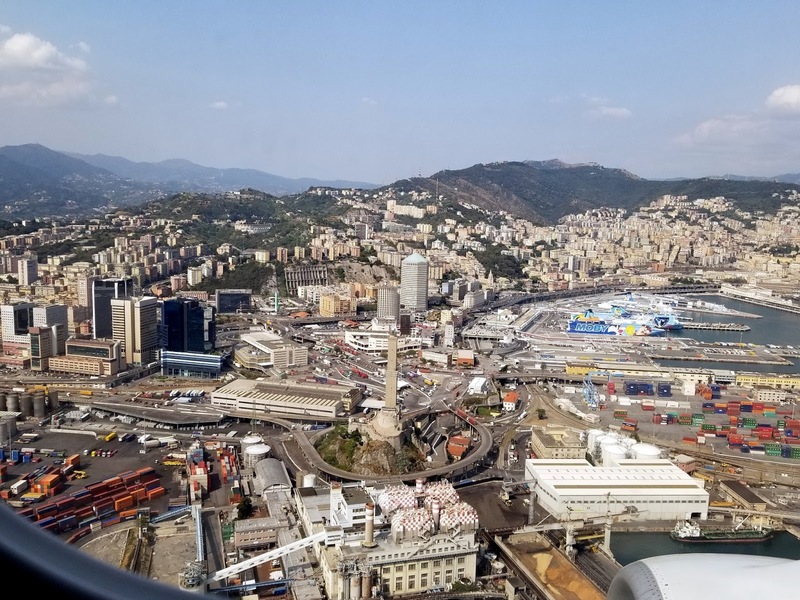 The panoramic view from the top of the belltower.The modern part of Genoa can be seen in the distance as well as the lighthouse called the Lanterna. 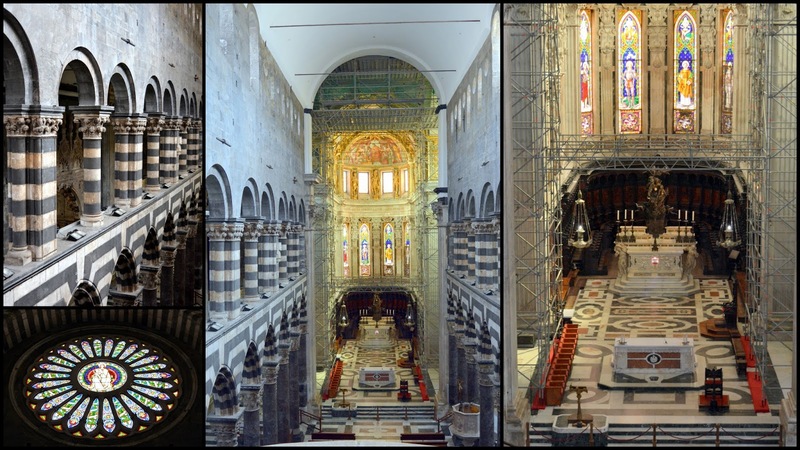 A nearby church's dome was under wraps as the church was undergoing reconstruction. The church of Santa Maria Delle Vigne (Saint Mary of the Vine--named for the vineyards that once surrounded it.) 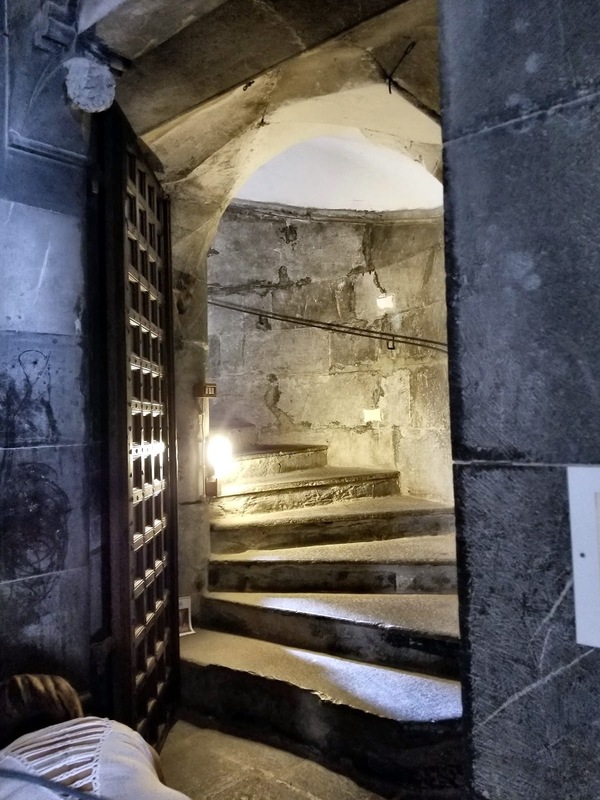 was constructed in the 10th century and it is very plain from the outside. The Palazzo Ducale was once home to the Doges of Genoa. It is now a museum and center for cultural events and art exhibitions. One day was not enough to explore all the interesting historic center of Genoa, to visit all its churches, or shops or cafes, but we had an enjoyable time seeing what we did and know that when we return to Genoa we will go back to see more! 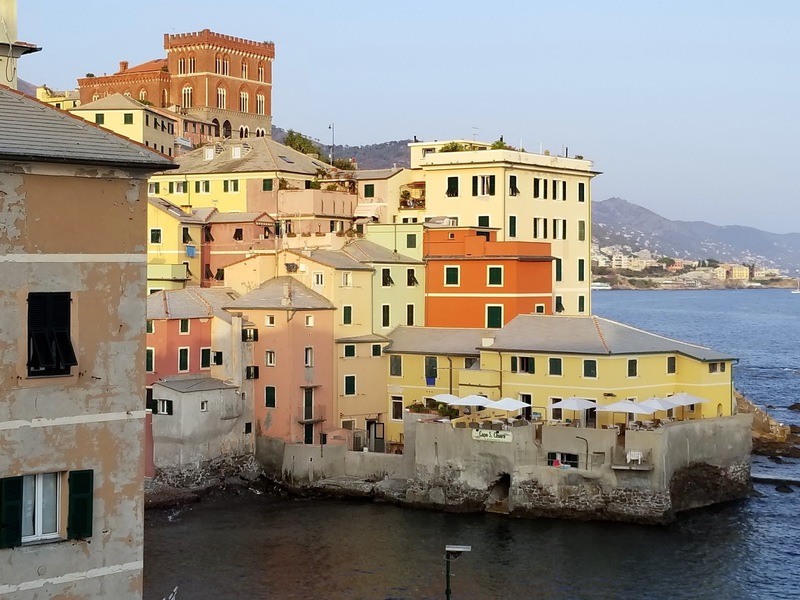 We returned to the neighborhood we were staying in, close to the soccer stadium, and had dinner that evening at a fabulous seafood restaurant called Da Marcello. There we had traditional Pesto Genoese pasta, frittata, and an amazing assortment of seafood. 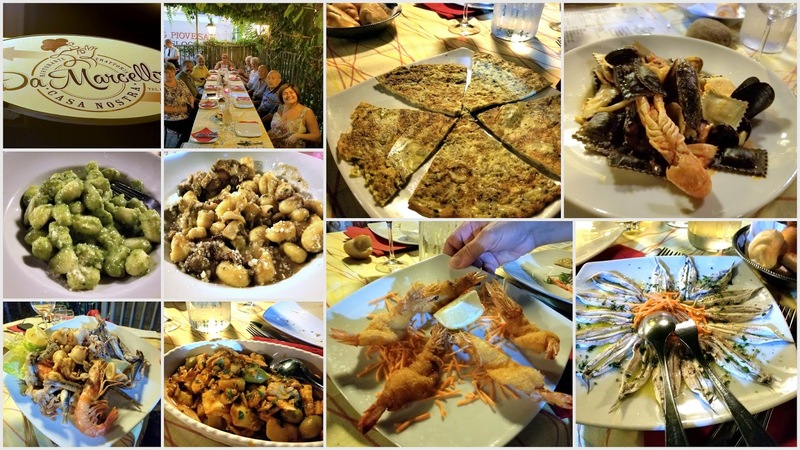 We enjoyed the food so much we returned a few more times during our visit! 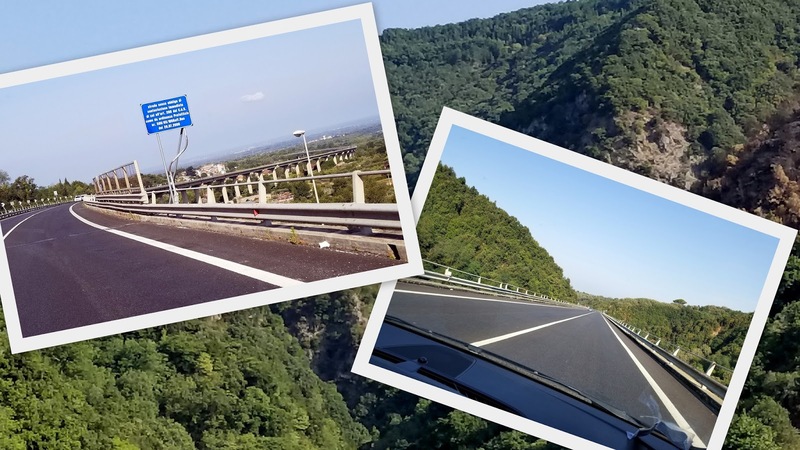 It's time to hop on a motorcycle and tour more of Italy in my future posts. 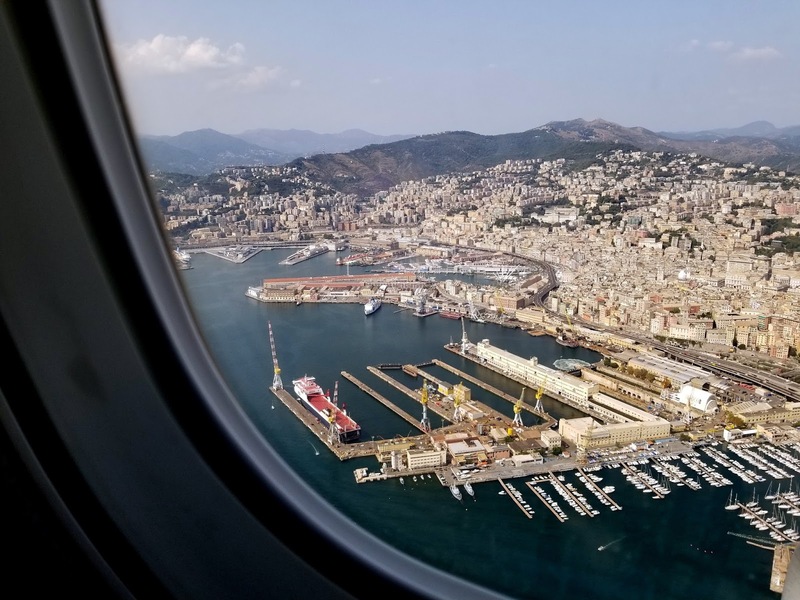 Ciao, Genoa! 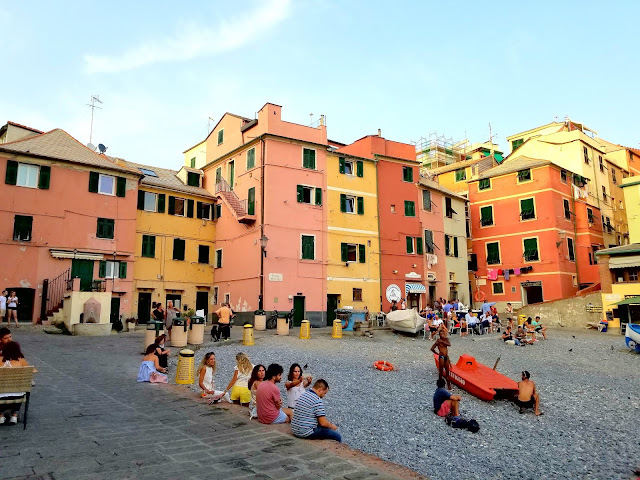 After arriving in Genoa, Italy and meeting all my husband's relatives, (see prior post--click here) one of the first places we visited was the very colorful and picturesque neighborhood of Boccadasse. It was once a separate fishing village but now is located on the northern edges of the city of Genoa and at the eastern end of the "Corso Italia," which is the main seafront promenade. 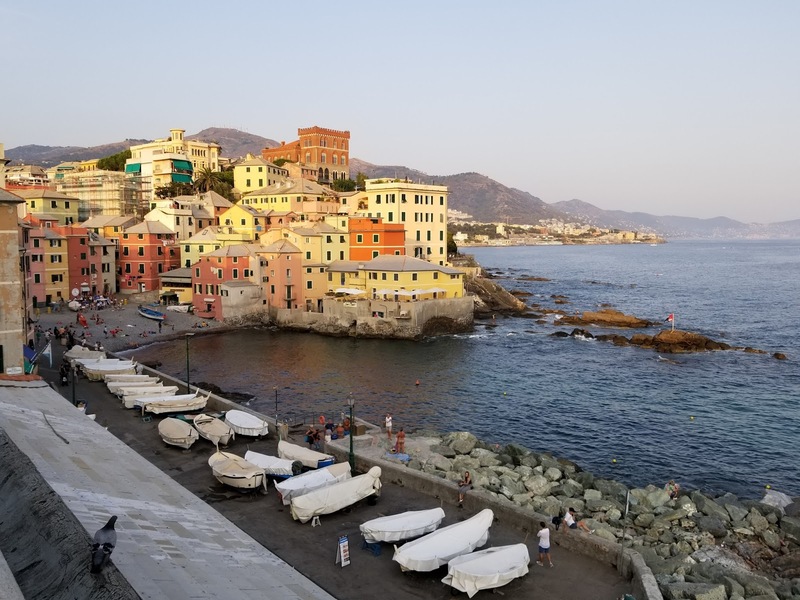 My husband's cousins drove us to the promenade so we could take an after-dinner stroll, called a "passeggiata," which is a very popular thing to do in Italy. Along the drive, we had views of the ancient walls of Genoa. 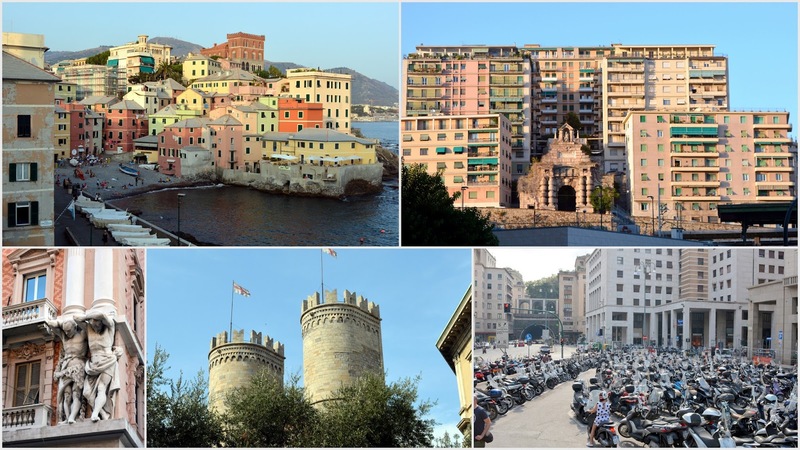 The city of Genoa has more surviving walls than any other city in Italy. We also saw some beautiful homes and hilltop villas. We stopped along the promenade to take a few photos and enjoy the view of the Ligurian Sea. Our first look at the Boccadasse reminded me of "Cinque Terre," or Five Towns area, that is located along the Ligurian Italian Riveria, which we visited years ago. 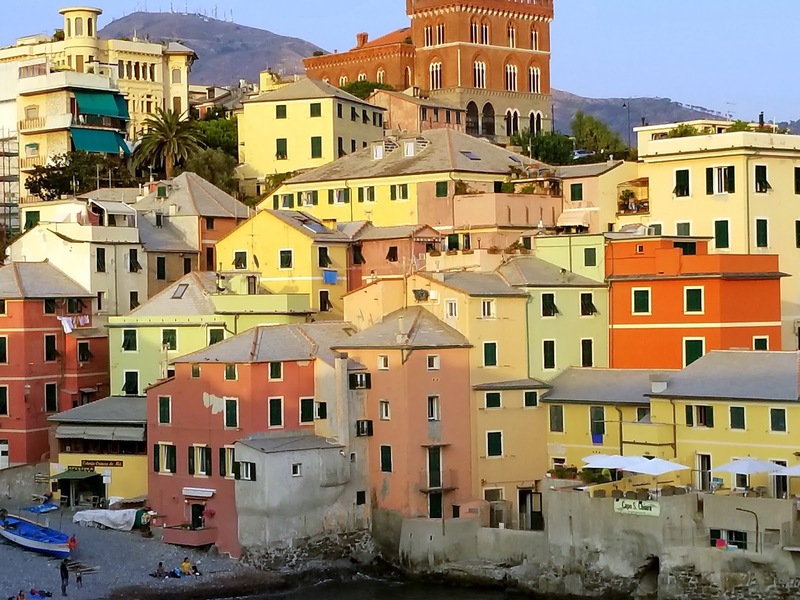 Cinque Terre was also filled with rustic, and pastel-colored villages. Off in the distance of Boccadasse can be seen the promontory of the town of Portofino. 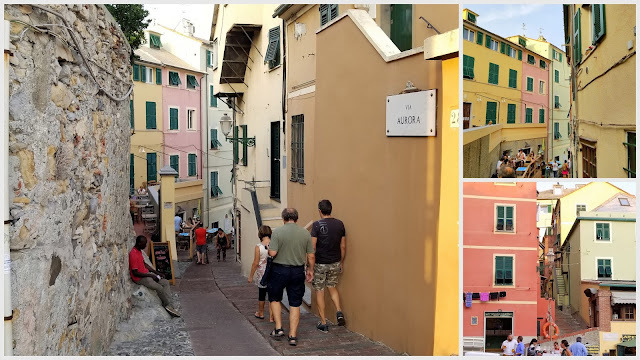 We walked down the steps to get closer to the Boccadasse area. ...and people enjoying the warm weather and calm sea. We wandered the narrow streets of the Boccadasse to see its restaurants, gelaterias, and small shops. A last glance at postcard pretty Boccadasse as we returned to the Corsa Italia to continue our after dinner walk before the sunset. We had a very full day of shopping in the local outdoor Genovese markets that morning, where we bought a whole crate of the most amazing porcini mushrooms, fresh vegetables, and fish. Cousin Marco prepared a delicious porcini mushroom sauce for pasta that afternoon and a delicious casserole made with fresh fish, hazelnuts, herbs and vegetables that were all purchased that morning! After such a feast we were happy that we ended the day with such a pleasant evening walk along the sea. 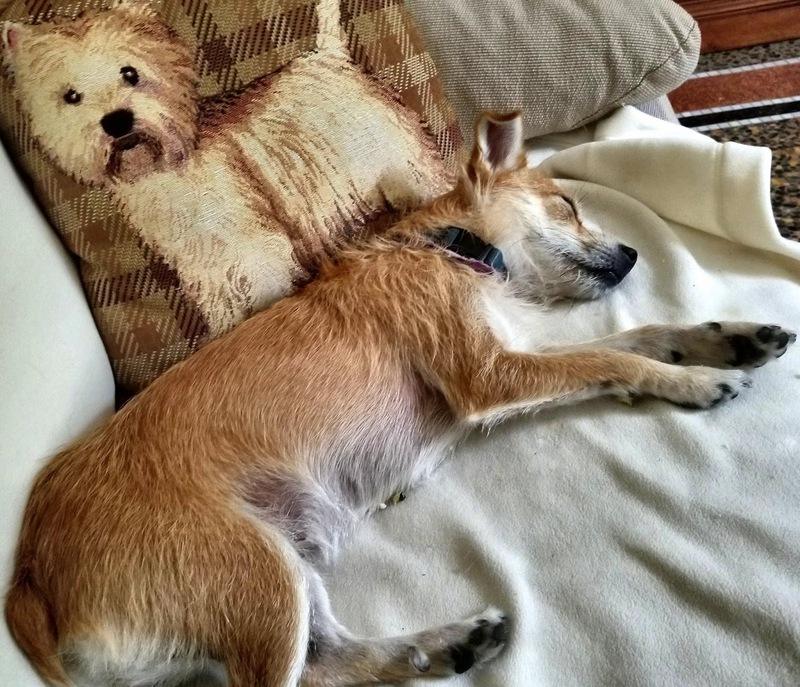 Like little Lucie, my husband's cousins' dog, we all slept very soundly that night! On our last day in Calabria (you can read all those posts on my blog, under the Calabria label, we drove on the Autostrada A2, or Autostrada Mediterraneo, over and around towns and the Aspromonte mountains to the Lamezia Terme International Airport, where we flew north to the Liguria Region of Italy to the city of Genoa. 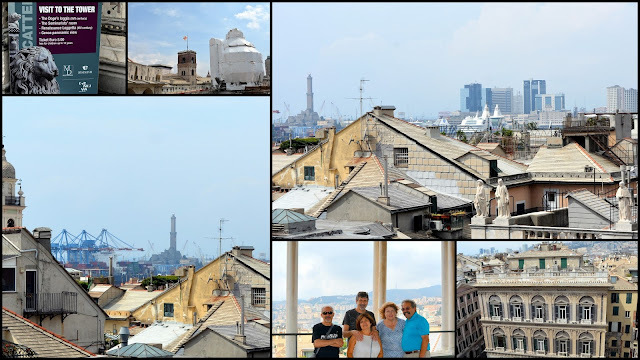 This was not our first visit to Genoa, as my husband has aunts, uncles, and cousins that live there, but on this visit, we were able to experience the city for the longest period of time and feel like true Genovese! 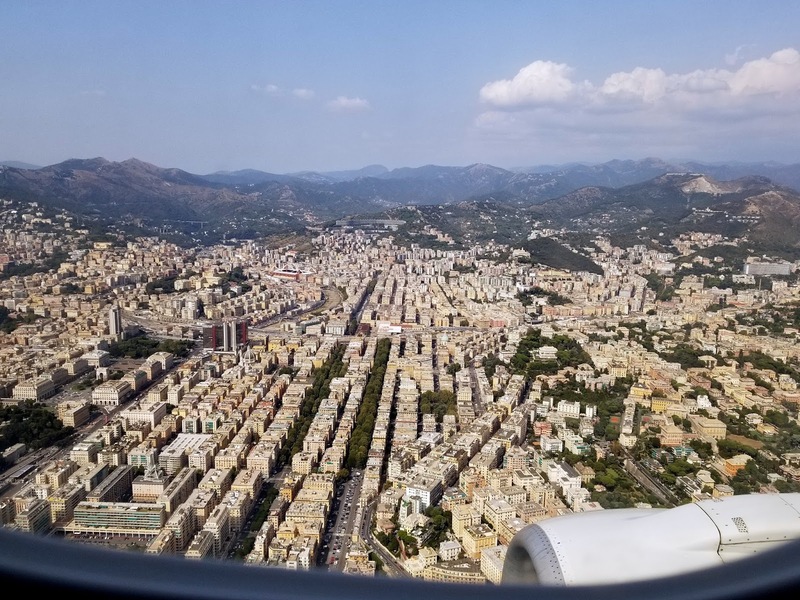 As our airplane approached the Genoa area I was mesmerized by the views from my window. 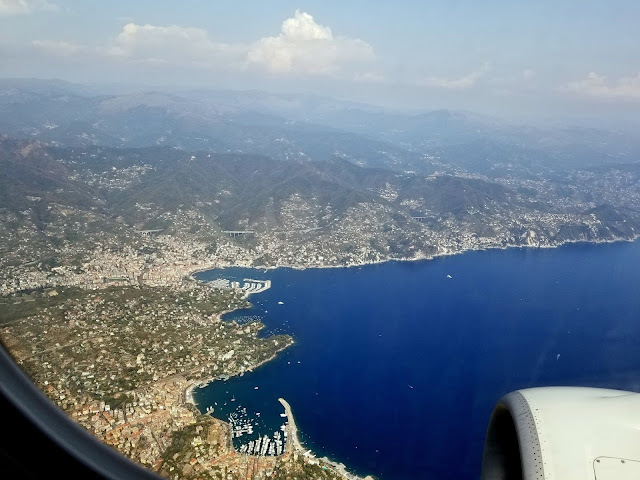 I could see very clearly the very blue Ligurian Sea, and all the boats moored in the small harbors and coves along the coast. The Apennine Mountains border the eastern side of the city. A view of the high-density city of Genoa. 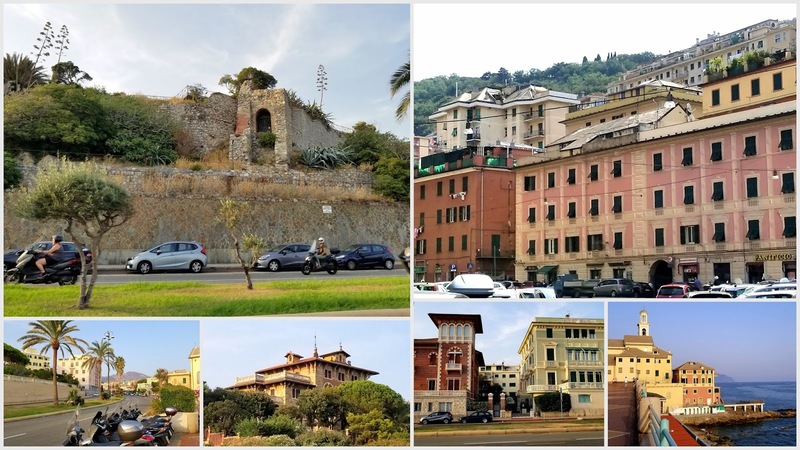 It is the sixth largest city in Italy by population, and one of its major economic centers. As you can see when you click on this photo to enlarge it, most of the residential buildings in Genoa are larger apartment buildings. 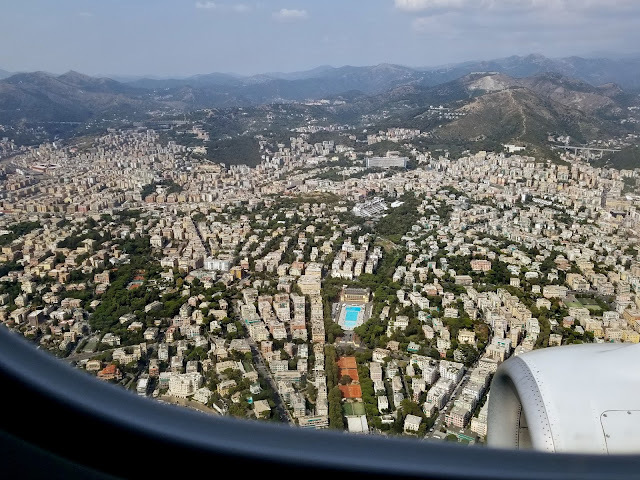 We stayed in an apartment near the soccer stadium, the Stadio Luigi Ferraris, which can be seen in the upper left near the Bisagno River. 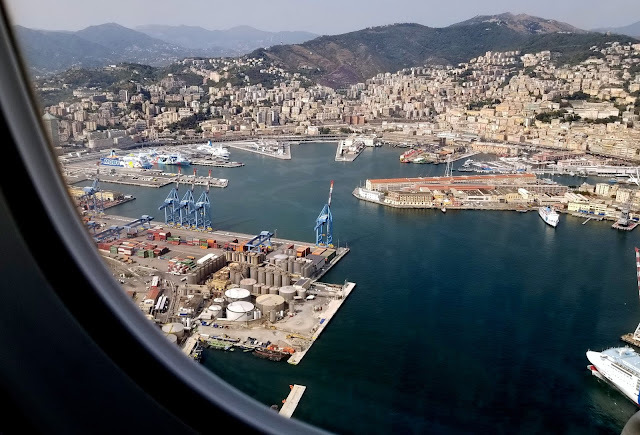 Now a portion of the large Port of Genoa, which is the largest and busiest in Italy. In the port, you can see passenger and container terminals, shipyards and other industrial and cargo industries, and marinas where sailboats and yachts are moored. In the center of the view above you can see the Lighthouse of Genoa, also referred to as the Lanterna. At 249 feet (76m) it is the world's fifth tallest lighthouse and the third oldest lighthouse in the world. We were so happy to see our relatives again, including two cousins from the island of Sardinia that were visiting. 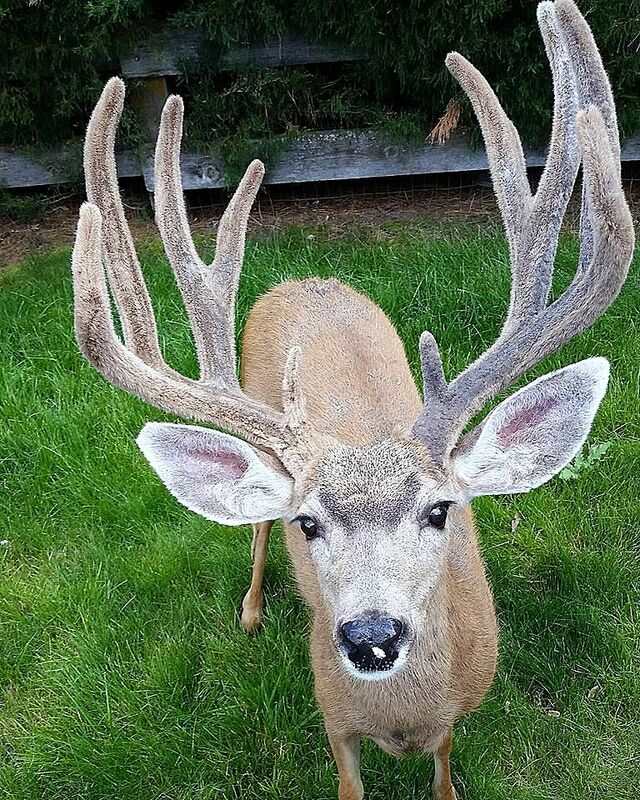 My husband's uncles are in their 90's, yet are active and robust. 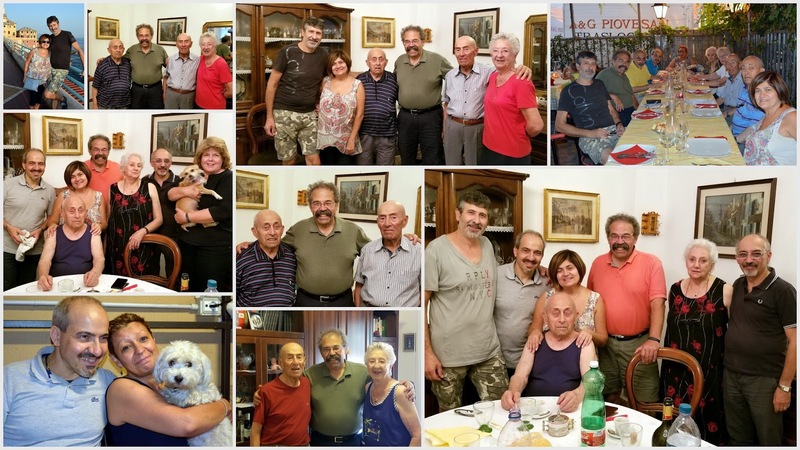 We spent much of our time with them, enjoying their company in Genoa, but did take a few days to take trips to Lake Maggiore, Verona, Padua, and Bologna. 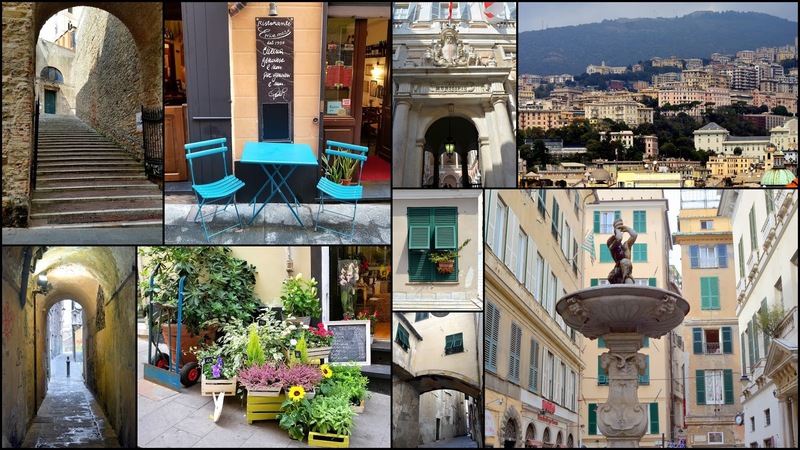 What were our first impressions of Genoa? It's a city of old and new standing side by side. 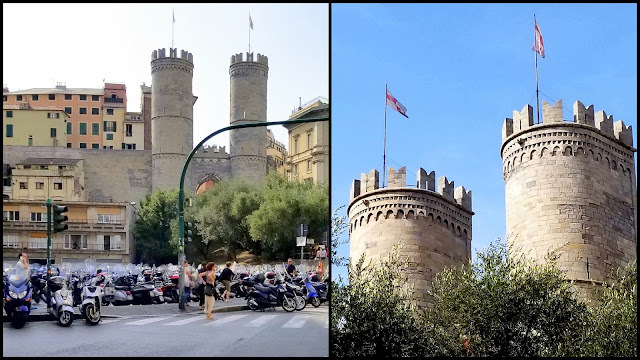 A city where history seems alive. 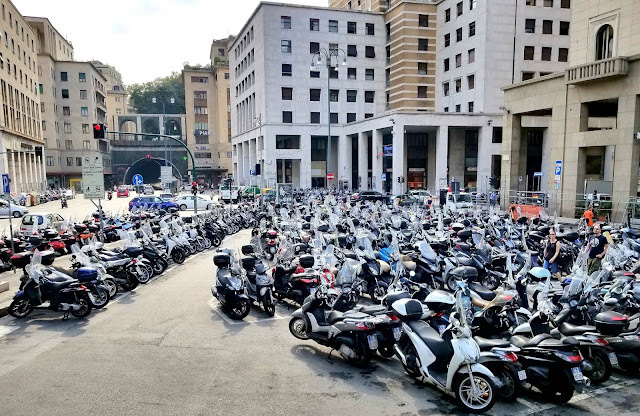 A city where the hustle and bustle of busy city streets that are filled with motorcycles galore meet grand tree-lined boulevards and grand villas and palazzos surrounded by gardens. Where ancient city wall remnants are surrounded by modern apartment buildings. 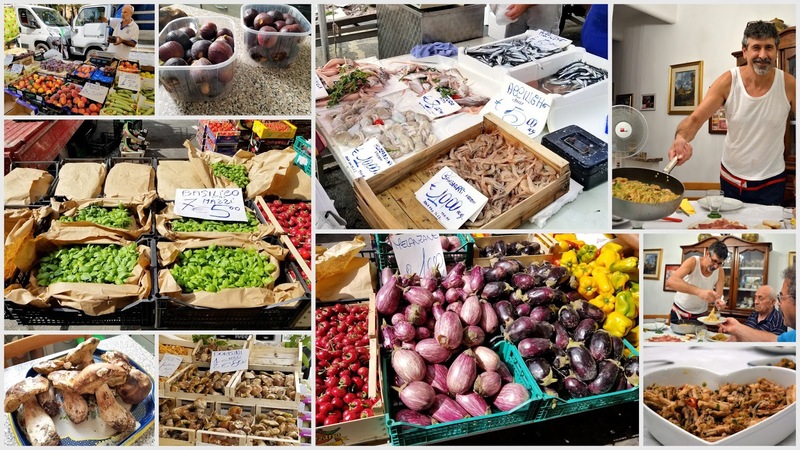 A city of friendly people and delicious cuisine. Genoa is the historic birthplace of the explorer Christopher Columbus, and this public park displays his three ships, the Nina, Pinta and Santa Maria, made with flowers. I was excited to see this again, after seeing it for the first time on a trip to Italy I made when I was a senior in high school. Old memories mingled with new on this trip. 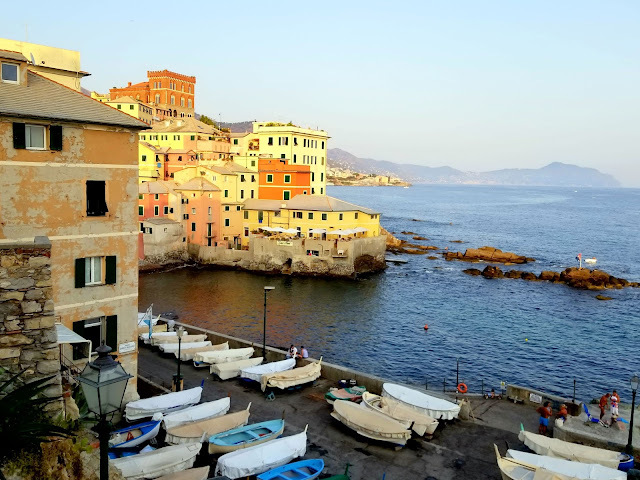 I'll be showing the historic medieval part of Genoa in my next post, with the old fishing district neighborhood called the Boccadasse, both truly the most beautiful and interesting parts of the city. 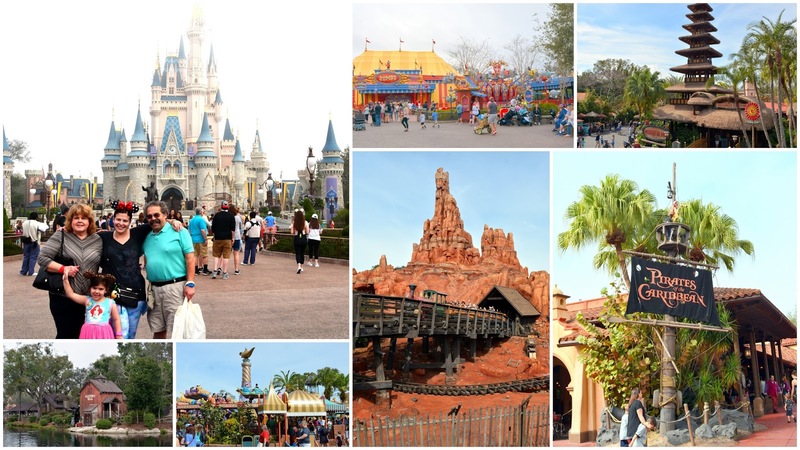 A Visit to Walt Disney World! Since it was a last minute trip we were fortunate to be able to make reservations in one of the Disney World Resorts--they are all popular and book up quickly year round. 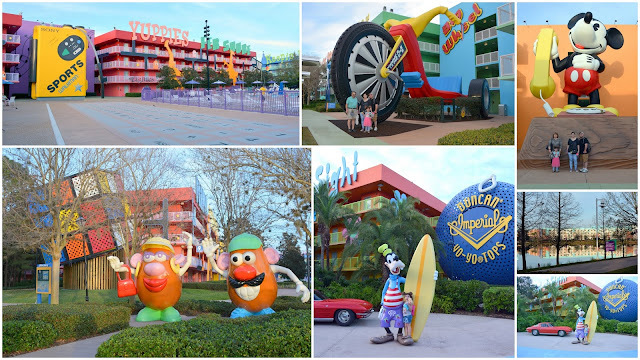 We stayed at Disney's Pop Century Resort, which was fun for our granddaughter, as it had giant fad memorabilia from the 50's to the 90's on the grounds. By staying in a Disney Resort we were able to take the free shuttle bus service to all the different Disney parks. 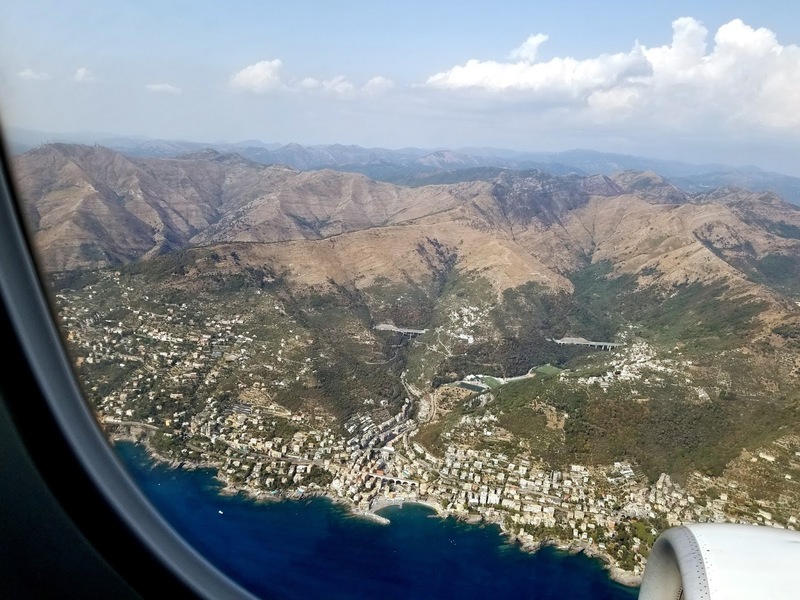 The day we were flying into Florida from Colorado, my daughter, son-in-law visited Disney's Animal Kingdom Theme Park and had a wonderful time going on a safari and taking turns going on other rides. On our first day, we visited The Magic Kingdom Park. It was so exciting to go on some of the iconic rides we remembered from past trips and also many new ones. Our granddaughter's favorite ride was the classic ride It's a Small World. I remember going on a version of this ride when I was a child, in the 1964-65 New York World's Fair. 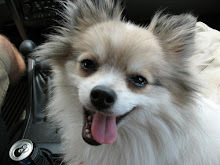 Do you want to listen to the song? Click here. 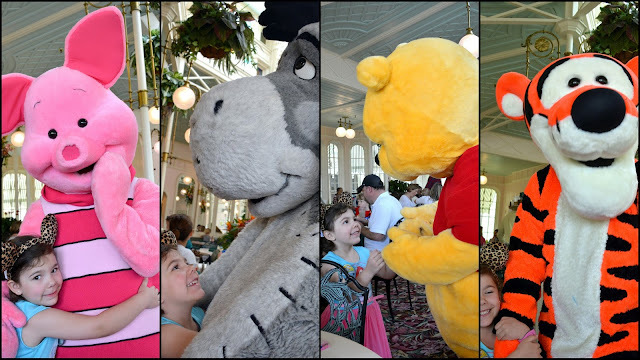 We had made reservations for a lunch buffet in the Crystal Palace, and our granddaughter was so excited to meet the characters from the 100 Acre Wood--Piglet, Eeyore, Pooh, and Tigger! 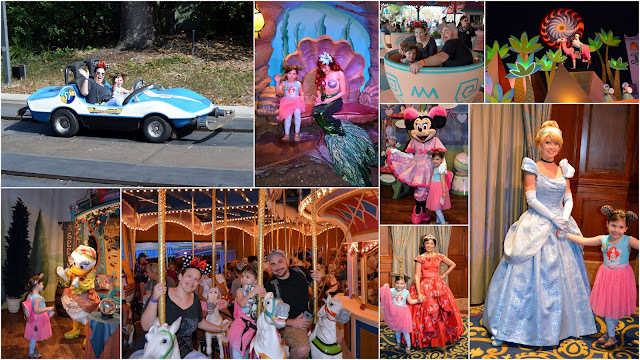 We went on many more rides after lunch, but meeting Disney characters and princesses were our granddaughter's favorite memories. Meeting Cinderella was a highlight! 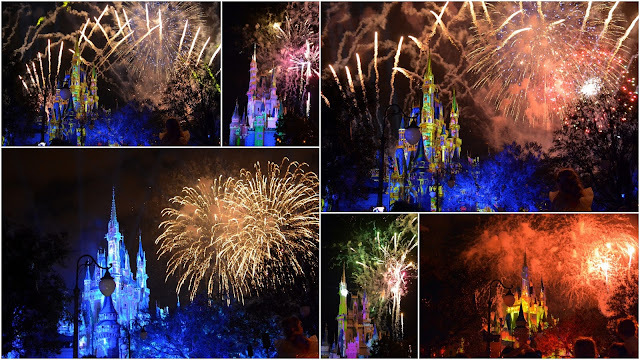 The evening ended with the Grand Illumination and Fireworks Show over Cinderella's Castle The castle was lit up with many scenes and music played before the fireworks show began. 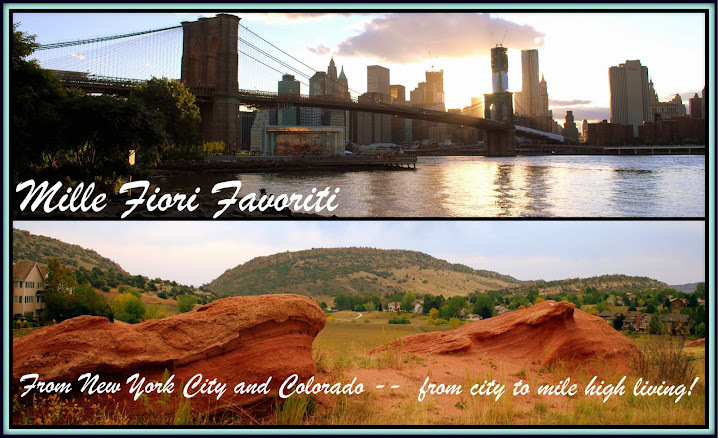 You can watch a short video of the fireworks at this link on my Mille Fiori Favoriti facebook page. The next day we visited Disney World's Epcot! We enjoyed so many exhibits there. The "Finding Nemo" ride in the Seas Pavilion and the aquarium. At the Living With the Land Pavilion, we enjoyed a boat ride through the greenhouse, and the ride "Soarin Around the World." We also enjoyed the Journey to the Imagination Pavilion, and we were happy to see the character "Figment" was still part of the exhibits. We took the Spaceship Earth ride inside the giant globe and took a family friendly Mission into Space in Future World. In the afternoon we visited the eleven countries of the World Showcase. Our granddaughter's favorite was Norway, as they had a Frozen After Ever ride. We had a delicious dinner in the Marrakesh Restaurant in the Morrocan Pavilion. Happily, we had the foresight to rent a stroller for three days to take our granddaughter around the parks, as there is quite a bit of walking required. At the end of our day in Epcot, my Fitbit told me I walked eight miles! One of my favorite shows in Epcot was the special Disney on Broadway Concert Series, where the original Broadway stars sang songs from Disney on Broadway Plays. It has a limited run, and we were thrilled to be there to enjoy this production. You can hear Mary Poppins sing in the Disney on Broadway Concert Series in the video above, that is also on my Mille Fiori Favoriti facebook page on this link. On our last day in Disney World, we visited Disney's Hollywood Studios. 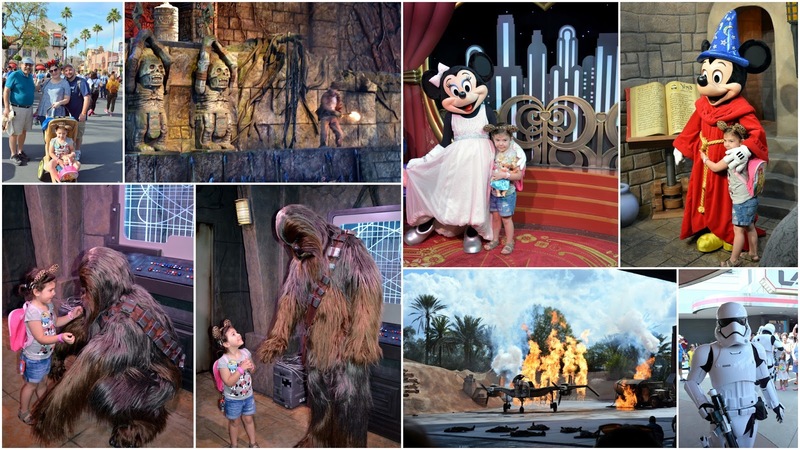 Many new attractions are in the works to open for this theme park, including the largest exclusive Star Wars area and a Toy Story area, but we enjoyed what was already opened. We sat in the audience for the Indiana Jones Epic Stunt Spectacular, remembering seeing this timeless stunt show with our children many years ago. When my husband and daughter and son-in-law went to ride the Rock N Roll Rollercoaster, my granddaughter and I went to the Frozen Sing-Along Celebration, which turned out to be one of our favorite shows of all! It actually snowed in the theater during the last song! Again, my granddaughter had a good time meeting Disney characters, especially Mickey Mouse and Minnie Mouse, and Chewbacca. We went to the Muppet Vision 3D movie, The Twilight Zone Tower of Terror, and the Star Tours--the Adventure Continues ride. 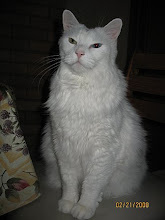 All in all, we had a wonderful time! 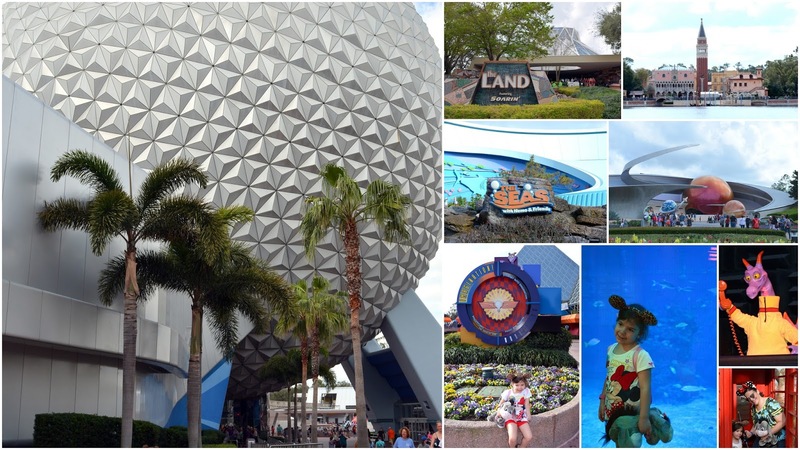 There is so much to see and do in Disney World that one visit can never be enough, and I know my family will be back one day. We returned home with many happy memories. Walt Disney World really is the "Happiest Place on Earth," where everyone can be a child at heart!